The Reynolds Homestead will host two acrylic painting classes at the Creative Arts Center, 334 Patrick Avenue, Stuart, Va. The artist/instructor will be Charles Hill. Landscapes will be the first class scheduled for Sunday, March 31st, 2-5 PM. Registration Required: $35.00 per person. 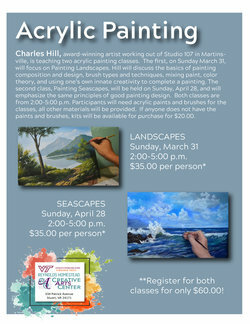 Seascapes will be the second class scheduled for Sunday, April 28th, 2-5 PM. Registration Required: $35.00 per person. Save $10 and register for both classes for only $60.00. Contact Lisa Martin at the Reynolds Homestead (276-694-7181) to register for these classes or for more information visit www.reynoldshomestead.vt.edu.